Last week I was passing through Whole Foods to pick up some Fair Trade Chocolate…when what to my wondering eyes should appear but – RHUBARB! I love rhubarb and can rarely find it, much less in wintertime. I bought a bunch of it, knowing full well that I had several recipes at home to try and this was the perfect opportunity. So what if it’s not a “Christmas dessert,” that’s sooooo overplayed anyway! *any coarse/grainy flour should work. The original recipe called for corn flour and I actually used a combo of whole wheat a graham flour because I happened to have it on hand. Using a pastry blender or a food processor, combine dry ingredients with butter until mixture resembles coarse cornmeal. Add heavy cream and egg yolks until combined. On a well-floured counter, knead dough into a mass and then divide into 10 equal pieces (more or less if you want extra small or extra large tarts). Using the heel of your hand, flatten each portion into a rough circle, reaching about 4” diameter. Work quickly so it doesn’t get too warm. Spoon 1-2 Tablespoons of the Rhubarb Vanilla compote into the center of the dough. Fold edges over to create a pocket. It should look rustic, not perfect. Preheat oven to 375. Bake frozen tarts for 35 minutes or until edges are brown and rhubarb is bubbling. Serve warm or at room temperature. Rinse rhubarb and trim ends. Cut in half lengthwise and then on the diagonal into 1” chunks (will amout to about 3 cups). In a large pot, combine rhubarb, brown sugar, and vanilla and heat to medium low. The low heat will help the rhubarb release its liquid. Cover and cook for 15 minutes or until, a sauce has formed. Remove cover and increase heat to medium, cooking for 15 minutes or until rhubarb is completely broken down and sauce is thick. Don’t walk away, it could burn! *Compote can be done up to a week ahead of time. 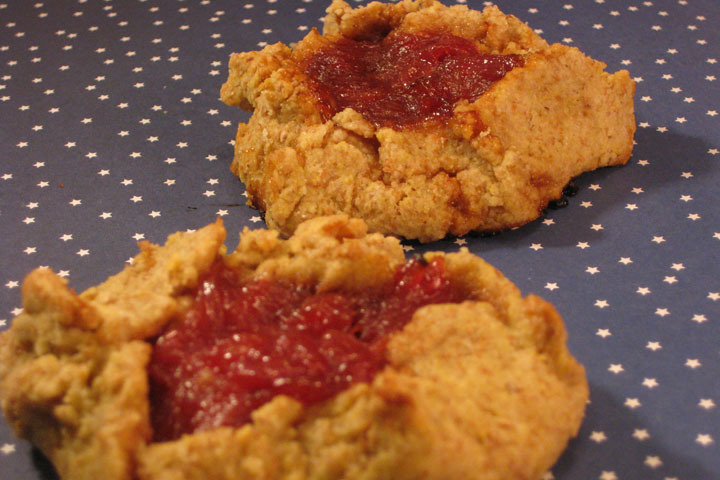 This entry was posted in Baking Jumbles and tagged pastry, rhubarb, tart. Bookmark the permalink. Sign me up. You know how I feel about rhubarb. I think it’s totally okay to want to spend Christmas with the ones you love, and that includes rhubarb.